Happy Hour Flow is a lunch hour class to energize your mid day funk. and (insert drum roll), it’s only $10!! Diaspora is a complex word that signifies both place and displacement, connection and disconnection, memory and futurity. Theater of the Oppressed (T.O.) is a theater methodology created by Augusto Boal that equips and empowers oppressed people to transform society through art. CTO (Center for Theater of the Oppressed in Rio de Janeiro), was founded by Augusto Boal himself in 1986. CTO is one of the homes of T.O. and is at the forefront of continuing social justice work through theater. Every December, CTORio holds a T.O. training specifically for English-speakers. This year CTO is adding another training in June, so there will be two trainings in 2019 for participants to choose from. Each 2-week program will include an in-depth introduction to the methodology and rigorous facilitation training guided by veteran CTO jokers. The end goal of the program is for participants to be able to incorporate T.O. into their ongoing work back home as teachers, activists, artists and community organizers. 2) make $400 USD non-refundable deposit (contact CTOenglishtraining@gmail.com for instructions). The program will be taught by veteran CTO Jokers, including Geo Britto, Julian Boal, Barbara Santos, and others. Geo Britto is a long-time member of Center for Theater of the Oppressed, Rio de Janeiro having joined the team in 1990. He is currently the Artistic Director of the School for Popular Theater (Escola de Teatro Popular — ETP). He has coordinated and participated in a myriad of T.O. projects in favelas (slums), prisons, mental health institutions, schools, universities and cultural centers: T.O. in Maré (2013-2016), T.O. in Mental Health (2005-2010), Cultural Center “Ponto de Cultura” (2005-2008), and T.O. in Prisons (2003-2007). He has led lectures, workshops and performances in Palestine, Bolivia, Mozambique, Egypt, India, South Africa, Argentina, Uruguay, Colombia, Peru, Mexico, Guatemala, Croatia, Portugal, Spain, Germany, UK, Canada and the U.S. Britto holds a Master’s in Contemporary Arts Studies from Universidade Federal Fluminense. Julian Boal has led T.O. workshops in over 25 countries and helped in the realization of T.O. festivals & conferences in India, Croatia, Spain, France and Brazil. He published the book “Images of Popular Theater” and has participated in groups such as Ambaata, GTO-Paris, and Féminisme Enjeux. He holds a PhD and is founder and pedagogical coordinator of the School for Popular Theater (Escola de Teatro Popular– ETP). Bárbara Santos is Artistic Director of KURINGA, a Theater of the Oppressed center in Berlin, and of T.O.gether Project & International Theatre Company made up of organizations from 7 different European nations. She is also the Artistic Director of the International Ma(g)dalena Network (Rede Magdalena Internacional), made up of world-wide feminist groups. In Brazil, Santos collaborates with Center for Theater of the Oppressed as the Editor of the journal METAXIS. She has 28 rich years of experience with the methodology, having practiced it in over 40 countries. She is the author of THEATER OF THE OPPRESSED, Roots & Wings: A Theory of the Praxis, released in 2016, available in Portuguese & Spanish. If you are not a Brazilian citizen or a citizen of one of the countries in the Mercosul coalition (Argentina, Brazil, Paraguay and Uruguay), you’ll need to obtain a tourist visa to travel to Brazil. You may do so by making an appointment at the nearest Brazilian Consulate — in the United States there are consulates in Los Angeles, San Francisco, Washington DC, New York City, Chicago, Miami, Boston, Hartford CT, Atlanta, Houston, and Norfolk VA. If you live outside of the US, you can find Brazilian consulates in virtually every capital city and most major cities. We recommend making an appointment as soon as possible as it can take weeks and sometimes months for a visa to be issued. We also recommend you book your flight well ahead of time, as prices can hike up fast. In order to participate in Day 1 of the program on Jun 23, your flight must arrive on or before Dec Jun 22. Your housing will be provided by CTO for the period of Jun 22-July 6 (you will be responsible for housing prior and after this period if you plan on staying in Brazil longer than the duration of the program). Rotating Teachers from the Local Contemporary Modern Dance Community! Join Marina for class THIS WED Feb 13! Theater of the Oppressed (T.O.) is a theater methodology created by Augusto Boal that equips and empowers people to transform society through art. The Center for T.O. (CTO), located in Rio de Janeiro, was founded by Augusto Boal in 1986. CTO is one of the homes of T.O. and is at the forefront of continuing social justice work through theater. Every December CTO holds a T.O. training specifically for English-speakers. The 2 week program includes an in-depth introduction to the methodology and rigorous facilitation training guided by veteran CTO jokers. The end goal of the program is for participants to be able to incorporate T.O. into their on- going work back home as teachers, activists, artists and community organizers. Study at the Center for the Theater of the Oppressed (CTO) in Rio de Janeiro and experience the world-renowned methodology created by Brazilian-born Augusto Boal. Through the use of theater games, exercises, and techniques, the CTO seeks social transformation employing art in the fight against oppression. CTO uses theater as a rehearsal space for social transformation by inviting the activation of the public who are capable of taking action. Work directly with CTO's educators, who were trained by August Boal, and still develop the methodology in different social contexts today. Join her for a very special DAY-LONG intensive that dives deep into the spirit-street connections of ancestral and social Afro-Brazilian dances. With live drums! Bring water and snacks, short breaks will be given in between class for hydration and transition. Some of LA’s most vibrant artists use their voices and bodies to illuminate their experiences. Stories untold, unheard and reclaimed, find powerful expression through Hip Hop, West African, Afro-Latin, Contemporary movement and live music. These artists embody their vision for the future - dancing chronicles of protest and liberation, reclamation and hope. Show is about 90 minutes, including 15-minute intermission. Your donations support the production of this show. Any amount is greatly appreciated. Join Marina for Radical Self-Care Yoga every Tuesday 8:15pm-9:30pm. Radical Self-Care offers a nourishing space for you to recenter, connect to your breath and body, and be held. This class puts into practice the idea that self-love and self-care are vital to maintaining overall wellness. We begin with mindful breathing, stretches, and gentle movement, before moving into a more vigorous flow. Class ends with restorative poses and a final relaxation in savasana, complete with aromatherapy. All are welcome! 7pm. We are located at 114 W. 4th St. Los Angeles, CA 90013.
residence Carolina Caycedo in collaboration with Isis Avalos and Samad Guerra. Carolina Caycedo’s River Serpent Book will be used as a score to catapult specific exercises around fluidity, containment, water, and environmental justice. Published in 2017, the foldout book encompasses five years of research and images on the significance and impact of damming rivers. Through both movement and conversations, dancers will develop a common language that will culminate in a public performance, following the workshop, on Sunday, November 12. Participants in the workshop are welcome to participate in the performance. Open to all. Some dance experience encouraged, but not necessary. Instruction will be available in English and Spanish. Space is limited and registration is required. If you are interested in participating, please rsvp here. Celebrating its 20th Anniversary, Viver Brasil will feature premieres by choreographers Marina Magalhães and Vera Passos, with new music by Kahlil Cummings and Simon Carroll. These works will illuminate the Afro-Brazilian ancestral wisdom of orixá dance and music, the social dances of frevo, samba and the spectacle of the bloco afro. This anniversary concert highlights Viver Brasil's joy, jubilance and artistic range as the company explores themes of race, gender and social equity. Our beloved Master Teacher Vera Passos is back in LA!! Dance with us for two intensive workshops exploring the intersections of Afro-Brazilian Orixa Dance Movement and the Silvestre Technique! ALL LEVELS ARE WELCOME AND ENCOURAGED!! The vibrant traditional and contemporary dance expressions of Salvador, Bahia are a celebration of life, culture, and community. Through an in depth exploration of the Silvestre Technique and Afro-Brazilian Orixá Movement, this two part workshop dives into movement and mythology, gesture and meaning. We will explore the intersections of contemporary and traditional dance representations of the forces of nature ( Earth, Water, Air, Fire) // Orixas. Class will focus on how these two dance idioms layer gestures to create meaning, and how these layers of interpretation can be brought out in our movement through individual and collective expression. Our workshop will feature live musical accompaniment so that dancers may gain an understanding of the interconnected relationship between dance and music within Afro-Brazilian movement practices. Los Angeles Dance Shorts Film Festival is an annual festival featuring dance films that are under ten minutes. The festival gathers creators and lovers of cinedance in one place, to celebrate dance film and inspire each other while spreading awareness of movement on film in the community. The Film Festival will take place at The Lyric Hyperion Theater & Café in Los Angeles on June 24, 2017 at 7pm. Ticket info coming soon. This year's festival will feature "IMA IMA", conceived, choreographed, and directed by Marina Magalhães featuring music by Sheila Govindarajan. "IMA IMA" is a movement and music landscape of dualities. Earth and air. Memory and discovery. Divinity and flesh. Following the calling of ancestors, the characters find grounding and release, they keys to unlocking their fullest selves. The People’s Institute for Survival and Beyond focuses on understanding what racism is, where it comes from, how it functions, why it persists and how it can be undone. This workshop utilizes a systemic approach that emphasizes learning from history, developing leadership, maintaining accountability to communities, creating networks, undoing internalized racial oppression and understanding the role of organizational gate keeping as a mechanism for perpetuating racism. This special version of the workshop is designed for self-identified artists, activists and educators based in LA. With 45 in the White House at the national level and our city of LA suffering from tragedies fueled by housing and income inequity, displacement, and police violence, it is more important now than ever that we unite to analyze the structures of power and privilege that hinder social equity and prepare to be effective organizers for justice in our communities. Coordinated by: Viver Brasil, CONTRA-TIEMPO, UCLA Art Global Health Center & Alkebulan Cultural Center. This workshop is made possible by the generous support of the California Arts Council and the Center for Cultural for Cultural Innovation. The vibrant traditional and contemporary dance expressions of Salvador, Bahia are a celebration of life, culture, and community. Through an in depth exploration of the Silvestre Technique and Afro-Brazilian Orixá Movement, this two part workshop series dives into movement and mythology, gesture and meaning. We will explore the intersections of contemporary and traditional dance representations of the forces of nature ( Earth, Water, Air, Fire) // Orixas. Class will focus on how these two dance idioms layer gestures to create meaning, and how these layers of interpretation can be brought out in our movement through individual and collective expression. Our workshop will feature live musical accompaniment so that dancers may gain an understanding of the interconnected relationship between dance and music within Afro-Brazilian movement practices. The Silvestre Technique is a contemporary Brazilian dance approach bridging the foundations of modern dance with Afro-Brazilian cultural symbols and gestures. Moving through a series of exercises -"conversations with the body," the Silvestre Technique works to prepare body, mind, and spirit for dance. These corporal conversations take the student out of a place of copying and repeating, allowing them to live each exercise and discover new possibilities.Through physical and expressive training, this technique creates a solid movement foundation for dancers of all backgrounds Exercises engage the Four nature elements: Earth, Water, Air, Fire; The Three Triangles: Balance, Expression, Intuition/Perception, and the Universe- Earth Connection. Dance Brigades Dance Mission Theater returns with its third annual D.I.R.T. Festival and all new programming. Dance In Revolt(ing) Times features cutting-edge dance makers that come together to examine the social-political issues troubling our tumultuous times through choreography and performance. For more information and tickets, please visit dancemission.com. Decolonizing the Body through Dance is a 1 day workshop based on the belief that decolonization is an inherently impossible act, yet worthy of pursuit. At its core, it is a workshop that values embodied expression, circular (non-hierarchical) learning and the generative process. This iteration of the workshop will be part movement class, part choreographic laboratory. The movement class will move away from a traditionally European-centered model (classical ballet, modern dance, etc) and towards a practice that honors Afro-Latin movement principles. Dancers will be encouraged to cultivate an intimate relationship with the ground, mobile spine and expressive pelvis, a social and playful improvisation, and circularity in their bodies. The choreographic laboratory will be a space for instigation and discovery, where dancers will be be given a chance to write, dialogue, generate and share their own material around the theme of decolonization. Contemporary Workshop with Marina at CMDC only $5!!!! Marina Magalhães offers a contemporary dance practice rooted in principles of the Afro-Latin Diaspora. Diaspora is a beautiful word that signifies both place and displacement, connection and disconnection, past and future. This dance class seeks to translate these ideas into the body -- how can we embody principles of Afro-Latin dance practices while exploring our own unique expression? How can we simultaneously embrace rigor and instinct, tradition and creativity, ancestry and individuality? Dancers are encouraged to cultivate an intimate relationship with the ground, a mobile spine and expressive pelvis, social improvisation, playful musicality and circularity in their bodies. 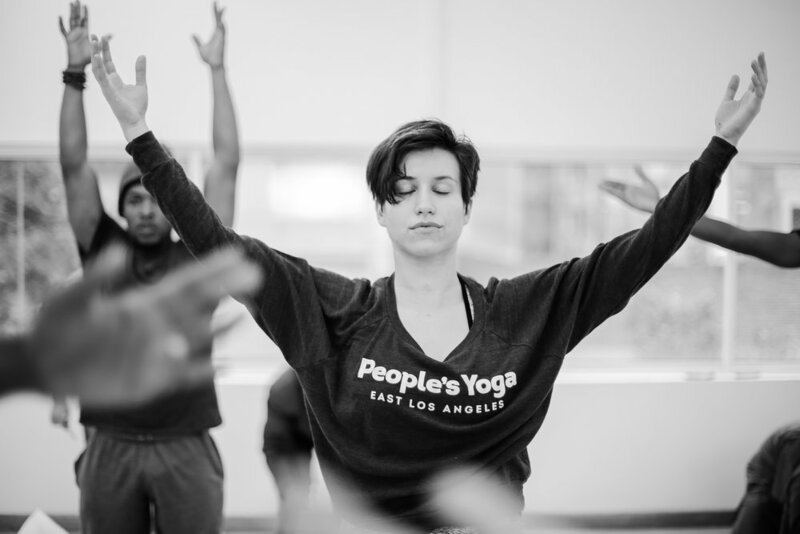 Class will begin in collective warm-up, move through improv exercises and skill-building phrases, and end in a choreography phrase. Come ready to sweat and play. Contemporary Modern Dance Collective offers weekly dance classes for only $5 every with a rotating schedule of teachers from the local contemporary modern dance community. Diaspora is a beautiful word that signifies both place and displacement, connection and disconnection, past and future. This dance class seeks to translate these ideas into the body -- how can we embody principles of Afro-Latin dance practices while exploring our own unique expression? How can we simultaneously embrace rigor and instinct, tradition and creativity, ancestry and individuality? Moving away from European-derived dance values (the linearity of classical ballet, the myth of the neutral body in post-modern dance), dancers are encouraged to cultivate an intimate relationship with the ground, a mobile spine and expressive pelvis, social improvisation, playful musicality and circularity in their bodies. Come ready to sweat and play. Join us for a work lecture/info session on Tuesday November 29th at the Drama League Theater Center. CTO Joker and Coordinator, Geo Britto will share the fundamental theories of the revolutionary theater method for social change, followed by a Q&A with attendees. You will also have the opportunity to learn about the English-language residencies being offered at CTO in Rio de Janeiro in 2017. "Decolonizing the Body Through Dance" is a movement research spearheaded by Brazilian-born dancer & choreographer, Marina Magalhães, based on the belief that decolonization is a futuristic process of reclaiming and reinventing tradition. It is based on five fundamental principles of African Diasporic dance practices: intimate relationship with the ground, mobile spine, playful improvisation, dynamic (off) balance, and circularity in individual movement and collective participation. Magalhães establishes these principles as core aesthetic values, while valuing each individual dancer's unique expression and innate ability to embody the principles in creative and generative ways. This iteration of the workshop will consistent of: warm-up (utilizing the Brain Dance methodology by Anne Green Gilbert), across the floor (improvisation & building shared vocabulary), and learning choreography. Some dance experience encouraged, all dance backgrounds welcome. VIP tickets include premium seating and raffle/opportunity drawing. Creative agency 52BLEND will celebrate the vibrant music, dance and kinship of the African and Latino cultures. AfroLatino will feature well-known local artists from the African-American and Latino communities of LA, including QVLN (Q-Violin), Very Be Careful, OVEOUS, Tshaka Campbell, Alberto Lopez, Kahlil Cummings, Gisella Ferreira, Rachel Hernandez, Marina Magalhães, Damon Turner, BSTWRT, Josiel Pérez, Esther Anaya and Latin Grammy-nominated Charanga Cubana. Narrated by Garth Trinidad, attendees will be entertained and educated about the history and evolution of Afro-Latino rhythms in a family friendly evening of African drumming, salsa, cumbia, samba, hip-hop and house music. Celebrate Labor Day holiday with Marina's Radical Self-Care Yoga Practice! Radical Self-­Care offers a nourishing space for you to recenter, connect to your breath and body, and be held. This class puts into practice the idea that self­love and self­care are vital to maintaining overall wellness. We begin with mindful breathing, stretches, and gentle movement, before moving into a more vigorous flow. Class ends with restorative poses and a final relaxation in savasana, complete with aromatherapy. All are welcome! Join us for the 5th Annual Power Fest on September 3, 2016. Power Fest is the premier political music festival in South LA that attracts thousands of families in a day of celebration, empowerment, and education. Power Fest takes place in Martin Luther King Jr. Park in the historic King Estates neighborhood of South Los Angeles. A playful class for the entire family to share movement and breath while having fun. This class is for all ages and all levels and combines movement and breath with creativity, imagination, adventure, sound and fun! $2 per youth under 18 years of age. "Decolonizing the Body Through Dance" is a movement research with politicized roots spearheaded by Brazilian-born dancer & choreographer, Marina Magalhães, based on the belief that decolonization is a futuristic process of reclaiming and reinventing tradition. It is based on five fundamental principles of African Diasporic dance practices: intimate relationship with the ground, mobile spine, playful improvisation, dynamic (off) balance, and circularity in individual movement and collective participation. Magalhães establishes these principles as core aesthetic values, while valuing each individual dancer's unique expression and innate ability to embody the principles in creative and generative ways. This iteration of the workshop will be part dance class, investigating the principles through Magalhães's movement approach, part choreography laboratory, giving participants the chance to explore and create material of their own based on the principles, and part showing, inviting community members to witness and dialogue with us about our process and findings. Some dance experience encouraged, no choreography experience necessary. Featuring 28 powerful dancers, 8 extraordinary musicians and 2 incredible singers with the Hollywood Bowl Orchestra, Viver Brasil will parade onto the stage in a Bahian Carnival spectacle featuring original bloco afro choreography, thunderous sounds, steps and rhythms in stunning costumes by internationally acclaimed Brazilian artist, J. Cunha. Spend your summer at the Center for Theater of the Oppressed- CTO learning about their on-going projects in Rio de Janeiro. Work directly with CTO’s “jokers”/educators, trained by Augusto Boal, and who today are developing the methodology in different social contexts. Theater of the Oppressed (T.O.) is a humanist methodology based on the belief that every human being is capable of making art. It invites the activation of the public who become “spect-actors”, capable of taking action and using theater as a rehearsal space for social transformation. Theater of the Oppressed has been an important instrument in the fight against oppression, the mobilization of social resistance as well as the creation of new laws. During the UCLA-CTO study abroad program, you will meet the Groups of Theater of the Oppressed (GTO’s) that work in various locations with a wide range of issues, like domestic workers fighting against sexism and for union worker’s rights (Marias do Brasil), mental health patients fighting against stigma and discrimination (Pirei na Cenna), black artist-activists fighting against racism (Cor do Brasil) and youth from favelas (slums) dealing with varying issues (T.O. na Maré). During the program, participants will also partake in a T.O. intensive, having the opportunity to experiment with and apply the methodologies they are learning about. This program is open to UC and non-UC students. For more information and to sign up visit http://ieo.ucla.edu/travelstudy/WAC-Rio. To learn more about the Center for Theater of the Oppressed visit www.ctorio.org.br.